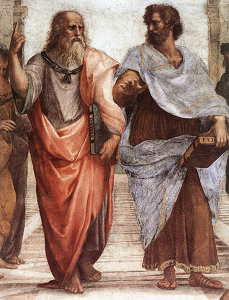 What is the difference between science and philosophy? While there are enterprises that are clearly in one or the other, the dividing line isn’t always a sharp one. Science grew out of philosophy, particularly natural philosophy. Some would say that science is itself a type of philosophy. But what is the difference between what we today call science and what we call philosophy? What is science? As in many broad categories of human endeavor, this is a difficult question to answer. Whole books have been written on the question of what is called, in the philosophy of science, the ‘demarcation problem‘, which is simply another way of approaching the definition. The definition many scientists seem to be the most fond of is Karl Popper’s falsifiability criteria. Popper said that for a notion to be scientific, there has to be a possibility that it could be, or could have been, proven false. In other words, it has to be testable, at least in principle. The falsifiability criteria does seem to have a lot going for it, but it’s reportedly not something most scientists use in their work. It mostly seems to come up when they are talking about pseudoscience (fake science). I’ve been reading a lot lately about the history of science. After reading about the scientific revolution, the history of astronomy, and of Galileo’s attitudes toward inquiry, I think there is a simpler more primal definition. Science is about reliable knowledge of how reality works, knowledge that allows us to make accurate predictions, and about methods of acquiring that knowledge. What we call today the ‘scientific method’ is actually just a collection of techniques that have proven over time to be the best ways to pursue reliable knowledge. If in the future, better ways are found, scientists by and large will eventually adopt them, albeit almost certainly with a lot of skepticism and caution at first. Indeed, the scientific method has been revised and improved considerably over the centuries. Note that ‘reliable’ doesn’t mean infallible. Scientific knowledge is never absolute. It is always provisional, subject to being revised or overturned on new evidence. Reliable just means that it is accurate enough to make predictions and perhaps, through technology, manipulate the environment. Science is practical; it is pragmatic; it focuses on what works. Because of this, it has little or nothing to say on questions that can’t be tested. That’s where philosophy often comes in. Analytic philosophy typically starts with uncontroversial premises, established facts, and extrapolates logically and rationally from there to deduce conclusions about reality. Philosophy can explore topics that science can’t. But by doing so, by going far beyond what empirical investigation can show, it gives up a lot of reliability. Philosophical conclusions can be logically valid but ultimately wrong due to facts we don’t know about yet, or from us not understanding the starting premises as well as we think we do. In other words, philosophical conclusions are, at best, hypotheses. You can’t count on them to build machines, bridges, or rockets. This is most explicitly illustrated by the lack of consensus among philosophers on most philosophical questions. Scientific equations like E=mc2 or F=ma are reliable knowledge about how nature works. They’re not absolute; Newton’s laws have largely been replaced by Einstein’s as an understanding of gravity, but Newton’s equations remain useful for much of NASA’s calculations. Contrast this with positions on free will, the existence of God, the mind body problem, and the morality of euthanasia, where many people may have confident positions, but those positions don’t have the reliability, the level of consensus, of scientific ones. What then is the use philosophy? Is it “dead”, as Stephen Hawking opined? The simple fact is, there are many crucial questions where we have to fall back to philosophy, where we can’t, at least currently, get reliable knowledge, where science can’t make determinations. In some areas, like ethics, it probably never will. In these areas, we really have no choice but to reason as best we can. The alternative is to simply fall back on emotion, tradition, or superstition, with all the problems they can bring. It’s also worth noting that what falls within the purview of metaphysics, of philosophy, in one century, could fall within the purview of scientific investigation in future centuries. Philosophy can have an important role in helping us to understand the critical questions. Questions that someday science may be able to seek an answer for. What can be scientifically established is often frustratingly limited. There are many philosophical conclusions that seem evident, but where the evidence isn’t actually in yet. It’s in these cases where the history of science should serve as a caution on assuming too much. Ptolemy had good philosophical reasons for his geocentric model of the universe, but he made what he probably saw as self-evident assumptions that ultimately gave him the wrong picture. Aristotle thought heavier objects fell faster than lighter ones, a view unchallenged until Galileo experimented on it. For millennia, it was thought that health was a matter of keeping “humors” (blood, yellow bile, black bile, and phlegm) in balance, until modern medical research in the 19th century. When Isaac Newton couldn’t fully account for the solar system’s stability, or why the stars didn’t collapse onto each other, he threw up his hands and said God had to help. Einstein famously couldn’t accept, first a dynamic expanding universe, and later the indeterminacy of quantum mechanics. Does this mean that we should regard the existence or nonexistence of notions that science can’t find evidence for as equiprobable? Not at all. There is a universe of possible scenarios and the ones some might like to be true are only an infinitesimal slice of those possibilities. We’re on acceptable philosophical ground to be skeptical of notions that have no scientific evidence. But given the limitations of philosophical conclusions, we should hold such skepticism with humility, and an open mind. This entry was posted in Philosophy, Science and tagged Agnosticism, Albert Einstein, Atheism, Einstein, Isaac Newton, Karl Popper, Philosophy, Philosophy of science, Science, Scientific method, Skepticism, Stephen Hawking, Thomas Kuhn. Bookmark the permalink. Excellent writing on a very pertinent and fascinating area of knowledge. I am one of those persons who think that science is a branch of philosophy, and I think this because philosophy deals with logical possibility and science deals with physical possibility, where a thing is logically impossible if it violates a law of logic (such as noncontradiction), and a thing is physically impossible if it violates a law of nature (such as the laws of gravity or thermodynamics). Something can be physically impossible but logically possible, such as a human flying by just flapping their arms, but nothing can be logically impossible and physically possible. For this reason, science falls under the domain of philosophy, as philosophy can rule out possible scientific positions but science cannot rule out philosophical positions. With this distinction in mind, I want to note that many historians think that Galileo disproved Aristotle’s theory of gravity not by conducting an actual experiment, but by using a thought experiment to show it harbored a logical impossibility. Galileo noted that if we drop a cannon ball and a cannon-ball tethered to a musket bullet, and Aristotle’s theory that heavier things fall faster is true, then the cannon-ball tethered to the musket ball falls faster and slower than the cannonball. It falls faster because the combined weight of the cannonball and the musket ball make it heavier than just the cannonball, but it falls slower because the musket ball falls slower than the cannonball as it weighs less, and drags on the cannonball it is tethered to. This is a logical contradiction, so Aristotle’s theory is erroneous. From this logical impossibility Galileo made conclusions about the physically impossibilities entailed by Aristotle’s theory, in order to posit theories about the laws of nature. 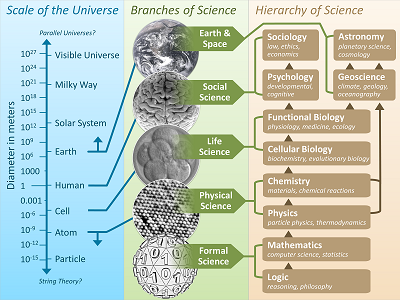 What this suggests is that the difference between philosophy and science is not methodological, as philosophical inquiry about logical possibilities benefits science, but rather that science is only concerned with conclusions about the laws of nature, whereas philosophy is concerned with conclusions about the laws of logic and by extension its implications for the laws of nature. Oops, sorry ausomeawestin. Looks like I muffed the reply, which is below. Thanks, and I appreciate your thoughts. Good points. I agree that science is a philosophy. And that logic is vital in science for forming hypotheses. Regarding laws of logic versus laws of nature, what is logic? Is it empirical? That is, are the rules of logic the most fundamental laws of nature? Laws that are so fundamental that they are part of our minds? If not, then from where does logic originate? If two logicians reach different conclusions, how do we resolve the difference? Bring in additional logicians? But what if no clear consensus emerges? (As is often the case in philosophy.) In science, these disagreements eventually get resolved by empirical evidence, but it’s pretty rare for anyone to conclusively win a philosophical argument. Finally, what about things like quantum mechanics, which don’t seem very logical, but that we are forced to accept due to the mountains of empirical evidence? I hadn’t heard that about Galileo’s experiment. It doesn’t quite fit with the picture of him I got from my readings (admittedly not exhaustive), where I was struck by how much of an empiricist he was. I don’t doubt he did a thought experiment first, but I’m pretty sure he wouldn’t have chanced only doing that before publication. My immediate reaction is that the laws of logic are made true by all the facts of all possible worlds, and we know this from intellectual intuitions — how things seem to us at first appearance in the mind’s eye. This is also why empiricism cannot give us full knowledge of what is logically possible. The empirical sciences discover whether x is physically possible in our world. Philosophy uncovers whether x is physically possible in other possible worlds. Whether x is physically possible on other possible worlds provides philosophers with more testable implications/hypotheses to work with and confirm than they would have if they were limited to just the facts of our world (for example, Mark Timmons and Terry Horgan use another possible world, Moral Twin Earth, to suggest that there it is physically possible for the moral realist’s causal regulation semantic theory to be true but with different moral properties regulating our shared moral terms, which the realist cannot allow). Thus, that logical possibility spreads out similarly over all possible worlds and the philosopher is studying logical possibility allows him to consider events that are not physically possible in our world, which creates the potential for more varied knowledge than that provided by empiricism alone. It might seem that given the intuitionist view I am proposing, that we cannot explain how to resolve conflicts when two philosophers have different intuitions. Providing a solution for this is not easy, but I think Michael Huemer has successfully argued that a first step is to remove external theoretical commitments that might obscure how the philosophers see things. More has to be done to address this problem, but I think that the Huemer’s point is sufficient to justify moving forward in testing intuitionism in other areas while more work is done to solve said problem. As for your point on quantum mechanics: let me be the first to admit that I do not know as much as I should about quantum mechanics. The little I do know leads me to say, however, that the results of quantum mechanics have been surprising given the theory of special relativity, but there is nothing logically impossible about quantum mechanics. It doesn’t require the existence of the equivalent of circular squares. If you are suggesting that it is unlikely that philosophers would have proposed quantum mechanics in the absence of the mounds of evidence gathered by physicists, then I agree, but that might be because of theoretical biases that would prevent philosophers from denying causal determinism and positing indeterminism at the quantum level. I’m not saying that physicists have not earned their accolades, and that philosophers would eventually have figured out what physicists did, but through intuition, I’m only suggesting that there are important ways of gaining knowledge that the empiricist/scientist cannot access. I’ve read in a few places that the cannonball experiment was a thought experiment (http://en.wikipedia.org/wiki/Galileo's_Leaning_Tower_of_Pisa_experiment , and in Doing Philosophy by Ted Schick, PhD from Brown U), but I think you’re right that he probably tried out the experiment in person before publishing. Though maybe not on the top of the Tower of Pisa! A lot of good information and new concepts and thinkers I need to look up. Thanks! My concern with relying on intuition is that our intuitions, outside of everyday life, don’t seem very trustworthy. If we hadn’t been taught since elementary school that the earth orbits the sun, we’d intuitively believe that it was the opposite, as, with the notable exception of a minority Greek philosophers, most of humanity did until the scientific revolution. From what I’ve read, most historians do think the experiment happening at the Tower of Pisa is apocryphal, but that he did do a similar experiment somewhere. (It may have been more like rolling large vs small balls down a ramp.) His argument with Aristotelians on the minute difference in when the balls touched ground sounds like a classic Galileo debate about the pragmatic results versus philosophical purity. The intuitionist is definitely obligated to respond to your objection that intuitions in general aren’t trustworthy; this thought has been the main objection to intuitionism since the get-go, and rightly so. Although this might be an unsatisfying response, I think the intuitions that we work with in philosophy are distinguished from our everyday intuitions by how we have those intuitions and not the qualitative feeling of having an intuition. In philosophy and everyday life, intuitions have the qualitative feelings of ‘immediateness’ ‘self-evidence’ and ‘seemingness’. Before Copernicus, I might have had the belief ‘the sun orbits the earth’ and held it as seeming self evident and appearing to be so. We now know this to be false. But rather than saying that therefore philosophical intuitionism is faulty, I think we should reconsider whether the false intuition was a philosophical intuition. It seems here that we have visual perceptions, that cause the formation of certain beliefs, and then these beliefs are taken to be obvious, as they have the explanatory power of explaining why we had the visual perceptions in the first place (Gilbert Harman has argued that this feature of a theory is what distinguishes science, and empiricism from rationalism). What I am saying is that this intuition was based in experience, of seeing how the sun rose and set in the horizon. This is what distinguishes it from a philosophical intuition; philosophical intuitions are not based in experience, and this because they are known just by reflecting on the terms and concepts themselves, and how they connect. In other words, philosophical intuitions are how we have a priori knowledge. That is why I don’t think the intuitionist is committed to saying that our pre-Copernican thoughts of the solar system were philosophical intuitions. What is more, I don’t want to suggest that philosophical intuitions are infallible, most intuitionists think we can make mistakes when thinking about concepts, that is, we can be mistaken on what we take to be a priori, and thus our intuitions are fallible. But due to conceptual error and not from drawing the wrong conclusions from experiences; the latter is what makes everyday intuitions fallible. The distinction between the two types of intuitions as being rooted in the distinction between a priori vs empirical (a posteriori) knowledge fits nicely with the distinctions I made in my last comment about the distinction between logical and physical possibility. Everyday intuitions are, I have argued, self-evident and obvious, because they are conclusions from sensory experiences, and philosophical intuitions are self-evident and obvious because they are known immediately in virtue of the meanings of the terms and the relevant concepts. For example, if I visually perceive that a grapefruit is bigger than an apple, and a watermelon is bigger than a grapefruit, then I might have the everyday intuition that the watermelon is bigger than an apple because I know from experience that if A is bigger than B and B is bigger than C, then A is bigger than C. The equivalent philosophical intuition would be had even if the person had never had the experiences necessary to conclude that if A is bigger than B and B is bigger than C, then A is bigger than C. If a person understands the meaning of ‘bigger’ and how logical connectives work in a proposition, then they do not need experiences to know the above statement, they know conceptually/a priori that A is bigger than C. So, tying this together with my previous comment: science deals with empirical/everyday intuitions to establish physical possibility for our world, whereas, philosophy deals with philosophical intuitions to consider logically possible physical possibilities on other possible worlds that we cannot know through experience. Concluding, I am grateful for your question, as it has allowed me to supplement my thoughts from the previous post. In other words, many thanks for responding to my comments! I suspect we agree on the relation between logic and empirical discovery, but that I’m more skeptical of a-priori answers. Not that I won’t take them if empirical data is unavailable. For me, philosophy is great for clarifying questions and potential answers. I think those are the logical possibilities you’re talking about. I’m just cautious of accepting a philosophical answer as THE ANSWER, if you know what I mean. It’s been a pleasure. I agree with what you’ve said. I think it is well advised to be cautious of accepting a philosophical answer as the answer, but I think the same should be said for scientific answers. I think there is a fundamental mistake being made in this discussion concerning the validity of certain intuitionist a priori impossibilities…ie. specifically the principle of consistency “that things cannot both be and not be at the same time, place, etc.”. Quantum mechanics quite profoundly proves this intuition false in the superposition principle…or, if you will, the physical fact of superposition. It is a prima facie example of a logical impossibility being an established empirical fact. There is no “understanding” of it…as Feynman said “it is the the real mystery” and as Niels Bohr said “if you are not astounded by it…then you have not understood it”. I think this fundamental “epistemological disconnect” at the foundations of all physical reality has certain implications…among which would be epistemological nihilism. I choose to believe we can know things, however, and this irreconcilable fact about our world points to a more fundamental reality that probably transcends our understanding because of the simple distance scale factor of our physical evolution into our present state…ie. -we are “midway” between the the microscopic realm of the quanta and the relativistic scale of the massive and distant and “fast” phenomenon of the universe. What is required is a mind that has evolved or is otherwise intuitively “at home” at both these physical extremes of scale….which mind has obvious, shall we say “theological implications”. The other option is to work out the implications of a world in which things can both be and not be, simultaneously. The implications of the superposition principle and it’s conflict with our most self-evident “Aristotelian laws of thought” seem to be completely ignored by the philosophical community. I appreciate your thoughts, and agree with much of what you wrote. It is worth noting that although we don’t really “understand” quantum mechanics, we have mathematics and structural theories that allow us to predict empirical observations. We can harness this structure and predictability for practical purposes. Many particle physicists like to say to each other, “Shut up and calculate”, to underscore that even without that underlying understanding, progress can be made. Thanks for replying, interesting post and video on the Sean Carroll link. I agree QM is quantifiable and “treatable” with mathematics, but it is the intuitionist epistemological aspects of phenomena…the axiomatic, self-evident “givens” of human thought that form the basis of our understanding. When these are violated, yet the violations are apparently true of our world…it seems to me to be something akin to “magic”. One definition of magic being “that of which we have no possible explanation”. It seems the metaphysical aspects of QM has such depth of implication as would make a whole separate branch of Philosophy…Physicists are notoriously dismissive of philosophy, Feynman’s famous saying “philosophy is as useful to physics as ornithology is to birds” comes to mind…interesting analogy which seems to imply the true science of physics (birds) is philosophy (ornithology). (something tells me he didn’t mean it that way though…”useful” being the key word, perhaps) I would reply with a Clauswitzian quip of my own: “Physics is too important to be left up to the physicists”. Honestly though, the philosophical aspects of QM seem to consist entirely of attempts to merely explain the base phenomena in layman’s terms…as if the statement “things exist” explains all of the subject of Ontology. Some physicists do have a tendency to dismiss philosophy, which is unfortunate. I’ve periodically suspected that some of them want to distance themselves from it since many of the more speculative concepts in theoretical physics border on metaphysics. And of course, there are some philosophers that deserve to be dismissed. I think we must hold back on saying anything categorical about science and philosophy because the simple answer is that we don’t know. Yet. What seems clear to me is that with science we are on a journey, and we don’t know where that journey will take us. It may lead to a dead end, or it may reveal some true understanding of something profound about the universe. Philosophy tends to go round in circles, because the truth is that we just don’t know the answer to most interesting questions that we can ask. We may one day arrive at answers to all questions, including “what is science” and “what is philosophy?” Or we may not. But it’s too early to know. Good points. I think it’s interesting that modes of human thought like science, philosophy, and religion, are so hard to define, with subjects on the borders often fought over bitterly. I’m currently in the early part of a book, ‘Farewell to Reality’ by Jim Baggott, which it appears will claim that much of modern theoretical physics isn’t science. “And to be cognizant of the fact that we may not even be aware of the philosophical assumptions that we’re making.” – I love this part. One thing to add about Philosophy (and mathematics) is that it can examine logical possibility in a way that purely empirical science cannot. Experimentation alone cannot give you the hypothesis, and no hypothesis is worth testing if it isn’t internal consistent – while all things that are causally possibly must be logical possible, the opposite isn’t true, and if we find something seems to be this way, then we’re forced back to the philosophical questions about the nature of reason anyway (as Jerry Wigglesworth does in his comment above, and as you do in your reply to ausomeawestin). A text you might have already read, but I figure I’d mention it anyway is Theory and Reality: An Introduction to the Philosophy of Science by Peter Godfrey-Smith. I’m a philosophy of science neophyte (I mostly work with ancient and medieval stuff, focused on narrative) and I found it to be a really helpful overview of these issues. Thanks for the book recommendation! I’ll check it out. I also found ‘Understand Philosophy of Science A Teach Yourself Guide’ to also be excellent. I’m currently reading Jim Baggott’s ‘Farewell to Reality’, which is critiquing much of modern physics for being more philosophy than science, which necessitates some philosophy of science discussion. I used to agree with this, but quantum mechanics has shaken my faith in it. QM wave / particle duality really makes no logical sense, but experimental evidence forces us to accept it. That said, I totally agree that exploring the logical possibilities sharpens our thinking in areas that science can’t currently or ever explore. I agree QM seems to violate our traditional notion of causality…In certain atomic decay events, there appears to be no reasoning as to when or why a specific event will occur, such as ejection of a subatomic particle….its individual dynamic prior to observation is inaccessible to us….we are reduced to observations that follow probabilistic laws. The relationship between causality and probability would seem to be a ripe subject matter. Meanwhile, we are reduced to a kind of “stochastic epistemology” that says any reality we observe is ultimately wholly dependent on the dimensionless numbers of probability. Quantum entanglement, or the traditional “instantaneous action at a distance” is part of the same group of ideas, and one would think…the same “ultimate nature” as wave/particle duality, or superposition…and likewise defies intuitionist logic about the physical world…Surely there is something “else” going on here…surely the “whys” of QM are not reduced to such brute-force, intractable facts about the world like “why there is something rather than nothing”. Again that may be a bias on our part….”the causal bias”. Or there could be some type of 3 valued logic….a “yes”, “no” and “indeterminant”…If cause and effect weren’t such a fundamental given in our world…very little science could be done…in fact, very little could be known about the world if physical cause and effect were not related. It might seem to be something strange, like out of Parmenides…where there is no change in the world….there is nothing but “The One”. Well said. The more I learn about QM, the more bizarre it seems. From what I understand, in order to accept hidden variables that restore causality, you have to give up locality, which is just as bizarre, and illogical. Bell’s theorem can be regarded as a proof that a “hidden variable” theory of QM is impossible. In other words, QM is genuinely non-deterministic. In simple terms, we cannot say whether an electron will have spin “up” or spin “down” before measuring it, even if we know everything that can be known about the system. There is nothing “hidden” from us that could have revealed the electron’s state. This is not illogical. QM is a very mathematical and logical theory. But it is counter-intuitive, because at the macroscopic behaviour we never encounter such behaviour. I’m not going to make any claim to understanding Bell’s theorem, but I’ve read that it would allow non-local mechanisms such as the De Broglie-Bohm interpretation. As I said above, that would still be very bizarre. I know QM follows its own mathematics and logic, but by illogical, I meant (and should have said more clearly) that there was no way any logician could have predicted something like the wave function collapse prior to the double slit experiments. I know what you mean, but all of science is like this. People believed that the Earth was flat because it looked flat. Then people believed that heavier objects fall faster than lighter ones, until a rigorous experiment proved otherwise. With QM, physicists are testing very basic assumptions, such as “is there causality?” It’s hard to empty your mind of prior assumptions to ask those kinds of questions and then to devise ways of testing them. In a recent post you asked the question, “is the universe mathematics?” I think that modern science shows that although the universe seems to be very mathematical in nature (to the point that if it was designed, it would have been designed by a very clever mathematician) it is a very particular kind of creation. It could have been a much simpler universe, but instead it seems to be really fiendishly complex. Good points. But they fit with what I meant, which is that we have to be cautious in assuming we know all possibilities from logical reasoning alone. Hi Mike, Thanks for introducing yourself by following our site. We look forward to exploring yours. If you’re on facebook we invite you to visit the RAXA Collective page. Happy New Year! Steve makes a good point, the flat Earth intuition, the logic of heavier masses falling faster may have seemed fundamental and compelling. Yet they are (retrospectively, perhaps) amenable to verification or rejection in a way that axiomatic, intuitionist logic is not. How does one approach by empirical means the proposition that, for example, a physical object is both black and white at the same time? Entangled particles are obviously, as the name implies…connected…in ways that make instantaneous action at a distance possible. Though no information is conveyed, “something” is…in such a way as to defy relativistic laws that govern our conception of spacetime…that manifold in which we like to think all of reality takes place, and in which the temporal laws of cause and effect seem to be irrevocably embedded…ie. super luminal velocities imply a nonsensical reversal of cause and effect. Any such ideas, like action at a distance, or “causeless effects” might be “said” in a sense, to take place, or have causes that originate “outside” our spacetime…whatever that means. IOW, if we can equate “all of spacetime” to “the universe”…then the universe is not, as materialists would like to think “causally closed”. Hi Jerry, yes, “spooky action at a distance” is an intriguing phenomenon. It doesn’t defy relativity because, as you say, no information is conveyed. But there is apparently a non-local action. What is the mechanism for that? We don’t know for sure. This is an active area of research that could lead to an explanation such as many-world theory or even a unified theory of quantum gravity. I find it interesting that empirical science shows us things that we could probably never have reached through logic alone. Could any philosopher ever have proposed QM as a possible explanation for the universe? I doubt it. Our thinking is too conditioned by things we think of as self-evident. Intriguingly, by observing the real world more closely, we are learning more about our supposed purely abstract ideas of logic. I agree with you on pseudoscience and the fact that scientific knowledge is never absolute – it really annoys me when bodies like the BBC freeze out sceptics on the ground that “the science is settled”. We need to get back to Popper’s standards of falsifiability. Arrived late, but what a great discussion! Philosophy is getting a raw deal, I’d say, but then it usually does. It seems odd to trust perception over intuition when perception is heavily theory laden (that the earth goes around the sun is a theory), while intuition is pre-theoretic. I suppose there’s quite a few different definitions of ‘intuition’, which confuses the issues. Also, intuition may easily be confused with what Kant calls ‘non-intuitive immediate knowledge’. The deciding factoid here, however, it seems to me, is that empiricism has never falsified a result of philosophical analysis. This suggests that where philosophers do not make mistakes their method is reliable and trustworthy. Thanks guymax. I certainly didn’t mean to denigrate philosophy, just to illuminate the different ways that science and philosophy add value. I’m not sure how you can conclude that empiricism has never falsified a result of philosophical analysis. I thought I gave examples in the post. On philosophers not making mistakes, how do we decide which philosophical conclusion is a mistake and which is not? You could say that whoever convinces the most people, but that hasn’t always resolved to the correct answer. I didn’t see an example of a falsification. I’ve never come across one. I’d be genuinely amazed if there were one, since it would prove that the universe is ‘illogical’. There’s lots of examples of empiricism falsifying faulty analysis, of course, but for this we must blame the workman and not the tools. The question of how we avoid mistakes in philosophy is interesting. It can be done, I believe, but it would entail abandoning our opinions and sticking to mathematics and logic,.while massively simplifying the issues. Even just the first of these tasks seems to defeat most people. My view would be that if a philosophical conclusion is or might be a mistake then it is not a conclusion but a conjecture. Where it is not a mistake it would be a statement of fact about Reality that cannot be overturned by empiricism. For instance, the MInd-Matter problem as traditionally formulated cannot be decided in philosophy. This would entail that it cannot be decided empirically. There is no chance of it happening. It is a well established conclusion that the problem is undecidable. Quite why so many people decide it for themselves, with no reference to the many centuries of philosophical analysis that concludes it is undecidable, and endorse whichever answer they happen to prefer, is not clear to me. It relates to the question about avoiding mistakes. Not everybody seems to want to avoid them. Well, if you ex post facto label any philosophical conclusion that science has overturned to be conjecture, then yes, science can’t overturn philosophical conclusions. I’m not sure though how workable that is for evaluating current philosophical conclusions that science hasn’t impinged on yet. On mind-matter, you might want to check out this post. Yep I’ll check that post. But hang on. I’m not ex post facto-ing anything. Clearly if a conclusion has been overturned it was not a conclusion of philosophy but the mistaken conclusion of some philosopher or other. Where philosophy can actually prove a result that result has never been overturned, as far as I an aware. This is a bit of a hobby-horse for me, since it seems that philosophy as a whole suffers a lot of unjust criticism that should be aimed only at the mistakes of certain philosophers. What would you consider to be an example of a result that philosophy has proven, that hasn’t yet been confirmed by science? PS. Looked at the MInd-Brain post SAP. Seems good to me. As the Upanishads say, there is no consciousness after death. Still, there is a distinction that can be made between intentional consciousness and awareness, and this complicates the issues. . . Thanks. I can’t claim familiarity with the Upanishads so I’m not familiar with intentional consciousness vs awareness distinction. This distinction is crucial. You may not agree that there is one, but mysticism becomes incomprehensible without it. .
For intentional consciousness we need a subject and an object. Yet Schopenhauer talks of his ‘better’ consciousness, for which this distinction evaporates, and so do all the mystics. This ambiguity what allows the Hindu Upanishads to state that there is no consciousness after death and yet be the oldest known religious scriptures and the foundation of the Hindu religion. It looks like a contradiction, but it is just a different idea of consciousness. An example of a philosophical result: Logic shows that Materialism is logically absurd. If physics cannot falsify this highly unpopular result of metaphysics then the rest should be pretty safe. More generally, metaphysical analysis shows that all positive metaphysical theories are logically absurd, so the target for empiricism is a big one. It’s interesting that many ancient religions didn’t have an afterlife concept. Even in the Old Testament, you find scant talk of one. And often the ones that did only had it as a depressing ghostly realm. On materialism, I guess it depends on what you mean by that term. If you mean substance dualism, in other words ghostly spirit stuff in addition to physical phenomena, then I can’t agree. If you mean that there is more to an object that it’s physical component, as in the information of its pattern, its structure, then I do agree. Yes! ‘Afterlife’ might be a very misleading word. The perennial philosophy speaks of something more subtle and wonderful than can written in a book. It is our ability to ‘partake of the perpetual’. This is why it has so often been considered heretical by monotheism, which usually also ignores any distinction between intentional consciousness and clear awareness. .
For me Materialism is simply the doctrine that matter is fundamental or independently exists . I wouldn’t want to argue about it. I just mentioned it as an example of a philosophical result that empiricism cannot overturn.